Pretend that you could book a trip for four days to anywhere in the world. Where would you go? Our friend and perpetual globetrotter Kelsey Thayer chose Iceland, and as expert travelers do, followed the perfect itinerary visiting as many iconic sights as possible. 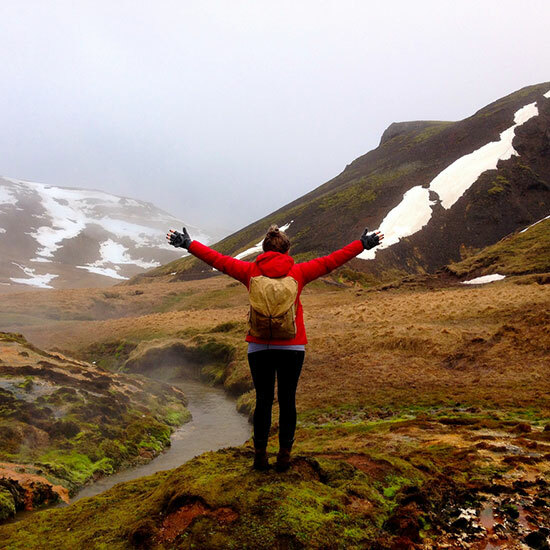 Lucky for us, she’s shared her top Iceland picks. Iceland had always been at the top of my travel wish list (thanks to an obsession with Björk and glaciers), so when a four day package deal from Washington D.C. to Reykjavik showed up in my inbox I said yes…along with nine of my friends! Icelandic travel has seen such a resurgence lately that getting recommendations on where to go wasn’t hard. With minimal planning, we set out to explore everything about Iceland that we possibly could in four days. Day one: After the six-hour flight, we rented cars headed into Reykjavik for a quick breakfast of skyr (Icelandic yogurt: do it) and coffee before heading to the Golden Circle. The three main sights that you must see are; Þingvellir National Park, the geothermally active valley of Haukadalur featuring two of Iceland’s most well known geysers, Strokkur and Geysir, and the majestic Gullfoss waterfall. Þingvellir (or Thingvellir) is a site of historical, cultural, and geological significance, as well a filming location used in season four of “Game of Thrones.” You can see why when you’re there: Looming rock formations with deep nooks and crannies amidst lush landscapes provide the perfect backdrop for battle scenes. Driving on towards Haukadalur, it’s impossible not to gasp at the views, but sights like this are commonplace for Iceland. We got to the geysers and were able to see Strokkur erupt a couple of times roughly every ten minutes. Our last stop on the Golden Circle was Gullfoss (or “Golden Falls”), a multi-tiered waterfall ending in a deep crevasse that seems to disappear into the earth. Our night ended with driving back to Reykjavik and grabbing burgers and fries at the Lebowski Bar (yes, fully devoted to the Coen Brothers ’98 cinema classic) on the popular Laugavegur Street. Make sure to stop by for an (overpriced) White Russian when you’re there – the dude abides. Day two: Woke up as rested as someone who’d previously been up for 37 hours possibly could be, we set out to see a bit of the city followed by a search to relax in some natural hot springs. Next stop was12 Tónar, a record shop that offers free espresso or tea while you listen to local artists sitting on one of the comfortable couches. Listed as one of the record stores you “must shop at before you die,” in the late 1990’s it was a popular hangout spot for Icelandic musicians including Björk and Sigur Rós. After that, we drove north towards the Reykjadalur valley to hike the slopes of Hellisheiði mountain range. With its abundance of geothermal springs, we saw everything from small gurgling melting pots to super vibrant heated pools of water. The perfect day hike, it was a prime example of Iceland’s spectacular beauty with its natural, and virtually untouched settings.